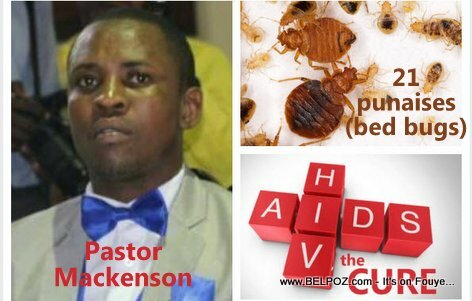 Believe it or NOT, Haitian pastor Mackenson Dorilas believes he has the cure for HIV/AIDS. So Pastor Dorilas called on all the AIDS patients in his assembly to take notes while he lists all the ingredients they will need to compose the cocktail cure for AIDS. Here is the cocktail you need to drink for 21 days if you have AIDS, a cocktail that includes 21 punaises (21 bedbugs)... Yep!!! Blend all of that together, the Haitian pastor Makenson said, drink one spoon each day for 21 days then go take AIDS test. Pastor Mackenson Dorilas is the leader of a church in Clercine, Port-au-Prince Haiti called Eglise de Dieu des Envoyes. For the record, this is NOT medical advice. We are just reporting what a Haitian pastor said. OK.
Pa al bwè pinèz blende sou kont nou selman! Ce n'est pas un Pasteur.